What now? This is a question that is on the forefront. Where do we go from here after having had a revolution that successfully overthrew a man who has left us to the dogs. What happens after Tahrir Republic has been evacuated? The only thing I truly feel is worth doing is taking Tahrir back with us. All that was good in Tahrir was already in the people who decided to leave their homes and live there. Now, Tahrir lives in us and we have to pass that torch to those numerous others who have not been to Tahrir nor experienced what it truly means. 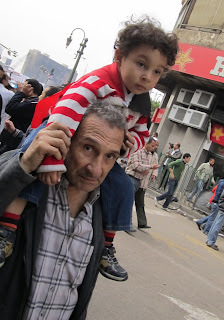 Tahrir is no longer a place we live in, it’s a place that lives in us. The revolution was a revelation that we can be something other than the opportunistic bastards that the old regime painted us to be. There’s more to us and now there’s more of us. Taking Tahrir was not easy, but taking Tahrir back with us will make it look like a walk in the park. There are tough days ahead of us when we have to battle the same battles we won in Tahrir with those who have chosen to watch. They do not recognize the change and it is our duty to take it to them. The real revolution is in this, that the tables have turned. Morality has a voice and we can scream at those evil crooks and they will be frightened. There is a change, a real change in the dynamics of power. Those who are fighting the good fight will find backers. There are so many of us. I will stop what I’m doing and join in the battle against whatever evil or corruption that I see. I know that I have comrades in this fight and I know that we can win all the battles just like we won in Tahrir. The rest all falls into place. The constitutional changes, the elections, the abuse, all of it will be handled if we take Tahrir with us back to our lives. We are the revolution, and everyone who has not been on our side and has not helped our cause has to remember this. We are the people who are to stand for what’s right and what’s just from now on. We are the people who will act in the face of hopelessness and we are the keepers of the flame we helped light.